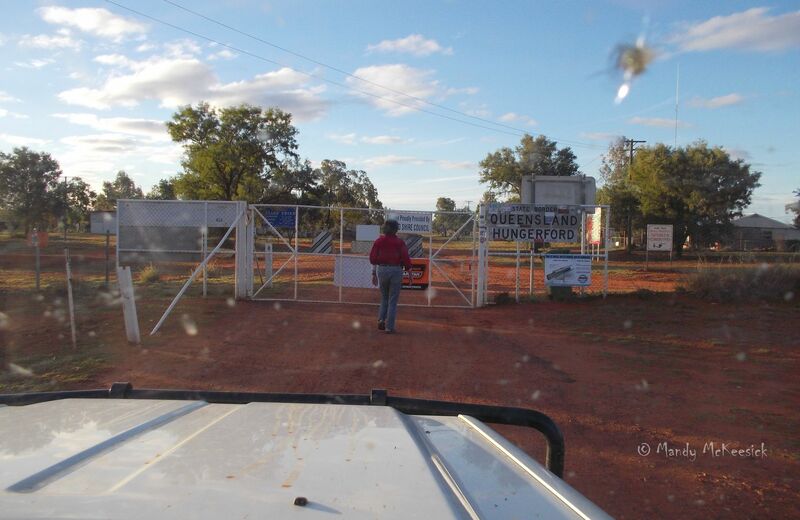 Two weeks later, after nine hours bouncing in the ute from Rocky Springs, we rattled through the gate in the dog fence that marks the Queensland / New South Wales border at Hungerford in the remote south-west of Queensland. The QLD/NSW border. The fence was constructed to keep out dingoes. 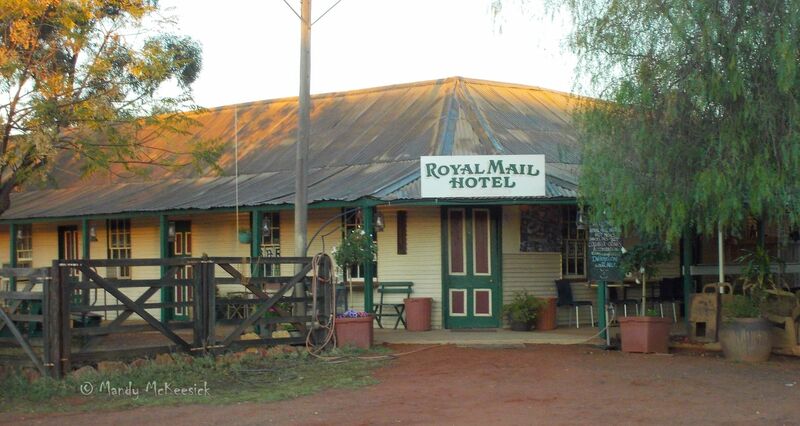 Boorara Station was another 40 minutes away over red dirt roads, but this night we were content to feed, water and sleep at the Royal Mail Hotel in a village half the size of Coolatai. Rested and raring to go we headed out the next morning over the puddled dirt road and straight into a red mud bog. 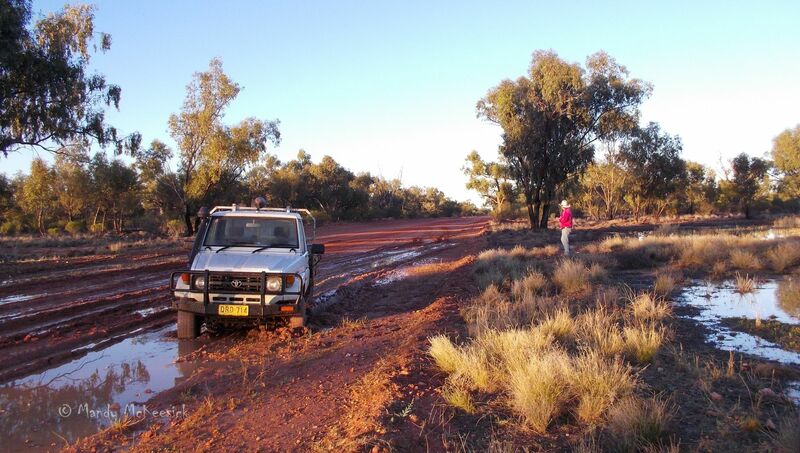 It wasn’t even 7am and we were stuck on an outback “highway” with not so much as a shovel. Idiots. Obviously we were well out of practice for remote travel. A bloke came along and drawled “yeah I saw that bog and stopped and put the wheel hubs in”. We had also stopped and put the 4WD hubs in. Trouble was we were already bogged when we stopped. With a few ropes and a good dose of country hospitality the bloke pulled us out and we continued through Currawinya National Park to Boorara. Boorara may be a remote outback station but due to the recent advertising it was fast becoming one of the busiest outback stations. We met the manager who told us he had just spent the last two days unbogging some young blokes (“oh, really,” we said) and had to get a radiator hose fixed on his old ute before the next inspection party arrived by plane that morning. He didn’t have a lot of time for us but told us we were welcome to camp at the homestead, gave us a map and left us to our own devices. 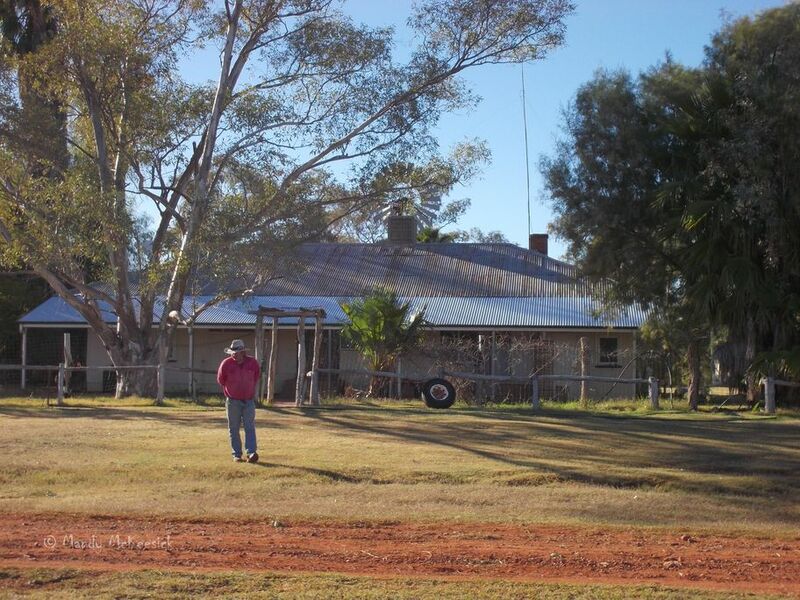 Boorara was once owned by the legendary Sir Sidney Kidman and in its heyday apparently housed a hundred workers. So that naturally means there was plenty of accommodation although most today would be classified as a renovator’s delight. The homestead complex is situated on a near-permanent pool on Boorara Creek. I say near-permanent because I doubt any creek would be permanent out here, but this one must be close, judging by the size of the yellowbelly the manager pulled out that night. The original homestead still stands but is derelict. The current sprawling homestead is interesting. The old section has thick mud-brick walls, broken windows, white-ant eaten door frames and sagging ceilings. The new section is a cavernous, concreted monstrosity. As I said, interesting. The Manager’s Residence. The veranda proved to be a great place to throw a swag. the four-bedroom men’s quarters, the eight-bedroom men’s quarters and the three-bedroom lake house. That’s a lot of men. However not a lot of money is made from buildings in Outback Australia so armed with the map, a GPS, a newly acquired shovel and a UHF radio we set out to explore 285,000 acres. This entry was posted in Far Horizons and tagged Boorara Station, Currawinya National Park, Dog Fence, hungerford, Sidney Kidman. Bookmark the permalink. Hey Mandy, is this your subtle way of telling us that first there was Kidman, and now there’s going to be McKeesick? It’s an interesting part of the world up there. I’ve camped on the Paroo in Currawinya NP and also at Wanaaring. Maybe you could do something like the Sherwins at Kilcowera (next door to Boorara I think) and get into the tourism thing. But sounds like you’d have to like hard work. But now muggins realises it’s a repost from a couple of years ago!! Anyway, it’s still a good story. 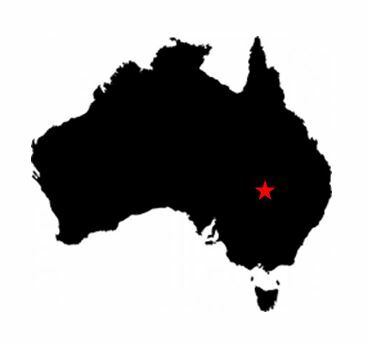 Stay tuned muggins – more to come from Boorara in the next few weeks. I actually just discovered that I have some new found freedom so why not! This sounds like a great beginning to an adventure.